Cement grout for tile joints Polymer Modified Grout for Wall & Floor Tile Joints: A high quality fine, polymer-modified, water - resistant, cement - based powder grout designed for grouting glazed wall tiles, mosaics, vitrified & fully vitrified tiles, floor tiles, industrial floor tiles, etc (where chemical resistance, hygienic and sterile is important use Dubond -Polymer Grout. Dubond's Dufill is a single part high degree of hardness, calibrated and smooth finish that is suitable for high resistance grouting from 1mm to 12mm on all horizontal and vertical surfaces with a complete range of tile and stone. It is thixotropic has a wide range of colors and finishes. the heavy research by engineers for innovations via market feedback has made DuFill an architect's choice and user's pride. DuFill range of colors band including classic Indian, Victorian, Contemporary. Extremely easy application and to clean even compared to normal cementitious sealants. Stable and uniform coloring for all types of tiles with exclusive color effects. The total absence of cracking or crazing during hardening. Packaging Details: 500 gms, 1 litre & 10 litres. 12 months in the original packing in dry condition. Foundation Grout is a thin mortar that can be poured and used to fill cracks in masonry or brickwork. Backfill grouting is the art of pumping grouts below slabs, behind walls, under roadways, around pipes, and in fact anywhere a void exists. This is required to stop the movement damaging the structure. Pressure Grouting Is the common term used to describe the pumping of grouts and mortars as opposed to tile grouting in bathrooms etc.Leveling and filling compounds are used to level surfaces, fill cavities, and shim or set machinery. They often have filling and sealing properties. Permanent filling of these cracks is required to control seepage, or to strengthen the foundation.So a mixture of cement and water is injected into the foundation under considerable pressure, from a hole drilled for this purpose. The hole has control valves mounted on it and is supplied with grout by the gear. This gear comprises an agitator, a pump, connecting hoses and a mixer. Dubond's Dufill is a single part high degree of hardness, calibrated and smooth finish, suitable for high resistance grouting from 1mm to 12mm on all horizontal and vertical surfaces with complete range of tile and stone. It is a thixotropic has a wide range of colours and finishes. the heavy research by engineers for innovations via market feedback has made DuFill an architect's choice and user's pride. DuFill range of colours band including classic Indian, Victorian, Contemporary. Before commencing grouting the adhesive bed must be set. It is essential that the tils used are appropriate for the service conditions and are fixed in a solid bed of adhesive i.e ensuring that, as far as possible, no voids are left behind the tiles, refer to the relevant product data sheet for setting / drying times. 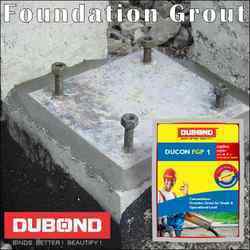 Dubond’s Ducon FGP 2 is Foundation Grout is supplied as a ready to use dry powder. The addition of a controlled amount of clean water produces a free flowing, non-shrink grout for gap thicknesses up to 100 mm. 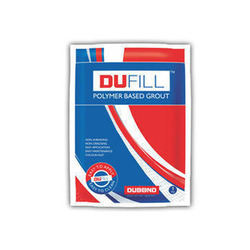 Ducon FGP 2 is a blend of Portland cement, graded fillers and chemical additives which impart controlled expansion in the plastic state whilst minimizing water demand. The low water demand ensures high early strength. 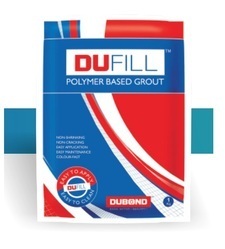 The graded fillers are designed to assist uniform mixing and produce a consistent grout. 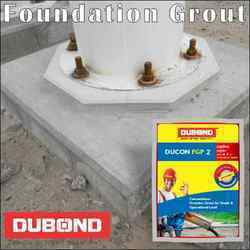 Ducon FGP 2 is used for precision grouting where it is essential to whilst the Static and Dynamic loads. Typical applications would be the grouting of base plates of turbines, compressors, boiler feed pumps etc. It can also be used for anchoring a wide range of fixings. These include masts, anchor bolts and fence posts. The grouts can be named as Joint Filler, Non shrink Grout , Cement Joint Filler, Polymer Grout, wide joint Grout Etc. 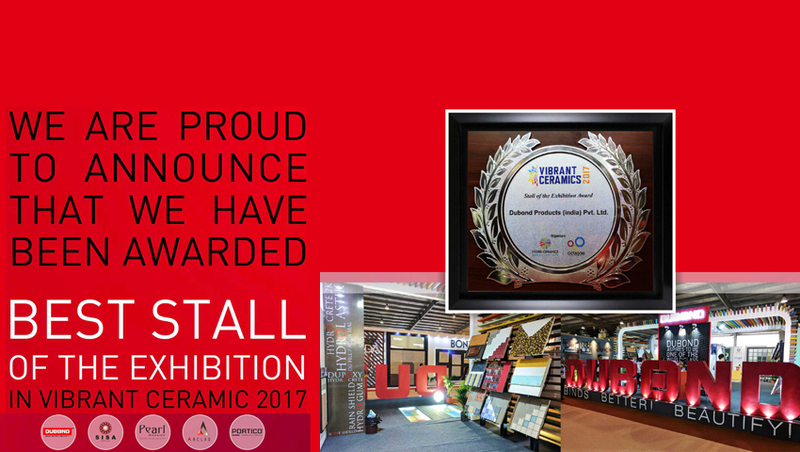 Aqua Seal Polymer Grout, waterproof grout is a single part high degree of hardness, calibrated and smooth finish that is suitable for high resistance grouting from 1 mm to 12 mm on all horizontal and vertical surfaces with complete range of tiles and stone. It is thixotropic. Its Polymer Based Powder Water Repellent Grout. Floors and walls, for internal and external use. For environments subject to heavy traffic, For internal and external use. Ideal for decorating corrected slabs. In domestic, commercial and industrial applications. Suitable for homogeneous tiles, ceramics, low thickness slabs and natural stone. Swimming pools, tanks and fountains and also in areas subject to thermal shock and freezing. High-performance grouting, from 0 to 5 mm, with extra-fine finish, high degree of hardness and reduced water absorption. Stabilized mineral grout containing pure NHL (Natural Hydraulic Lime) 5 for extremely colour-fast joints from 0 mm to 5 mm. Before commencing grouting the adhesive bed must be set. It is essential that the tiles used are appropriate for the service conditions and are fixed in a solid bed of adhesive i.e ensuring that, as far as possible, no voids are left behind the tiles, refer to the relevant product data sheet for setting / drying times. Protect open joints from contamination and ensure that they are clean, dry and free from loose debris prior to grouting. Do not use in damp conditions. Mix the cementitious powder with clean water until a lump-free smooth paste of uniform colour is obtained. If an electric drill mixer is used blend on a slow speed (less than 300 rpm). Avoid entraining air by mixing at too high speed or by over-mixing. Do not reconstitute the mixed grout by adding more water, this will reduce the final strength. It is thixotropic has a wide range of colors and finishes. the heavy research by engineers for innovations via market feedback has made DuFill an architect's choice and user's pride. The dufill range of colors band including classic Indian, Victorian, Contemporary. 1. Before commencing grouting the adhesive bed must be set. It is essential that the tils used are appropriate for the service conditions and are fixed in a solid bed of adhesive i.e ensuring that, as far as possible, no voids are left behind the tiles, refer to the relevant product data sheet for setting / drying times. Dubond's Dufill is a single part high degree of hardness, calibrated and smooth finish that is suitable for high resistance grouting from1mm to 12mm on all horizontal and vertical surfaces with complete range of tile and stone. It is a thixotropic has a wide range of colours and finishes. the heavy research by engineers for innovations via market feedback has made DuFill an architect's choice and user's pride. DuFill range of colours band including classic Indian, Victorian, Contemporary. 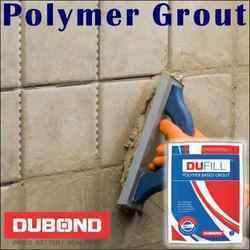 A synthetic polymer emulsions for use with dubond's cement based grouts. Suitable for use in interior and exterior locations in both dry and wet service conditions. Dubond TUFFEX GT is a polymer additive for dufill cement-based grouts. Not for use with adhesives. This admixture is manufactured under an approved quality assurance system conforming to BS EN ISO 9002 and in accordance with the requirements of the environmental standards and operational scope of BS 7750:1994. 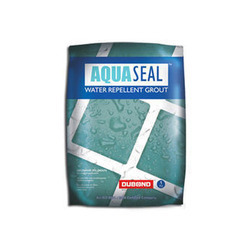 MixingFor most applications dilute 1 part Tuffex GT with 2 parts water use the TUFFEX GT : water blend to replace the gauging water when preparing the grout for use. 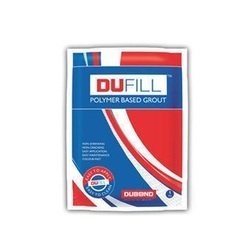 Installation procedureDubond's Du Fill cement-based grouts modified with Tuffex GT should be applied as directed in the appropriate product data sheet. The working time of the polymer modified grout may be shorter than that of the unmodified material, especially in higher temperatures. the colour of the set grout may appear slightly darker than when unmodified. use the same mix proportions throughout an installation to ensure uniform colour.